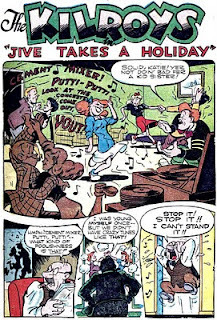 With the Thanksgiving break over, the weekly Red Hot Lindy Hop lesson and session returns this Friday. The lesson will be by Mike and Erin, with music by Mike. Free admission before 7:00 p.m., and $5 at the door afterwards. 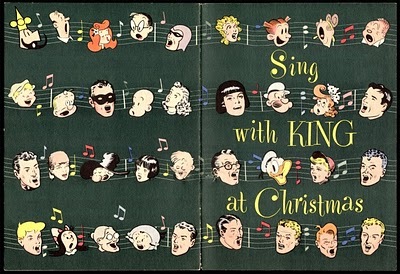 Now that the holidays are here, it was inevitable that songs of the season would make their way into my unconscious. This morning's Sunrise Serenade was "Santa Claus Got Stuck In My Chimney" by Ella Fitzgerald. Click on the song title to listen courtesy of Jazz On Line. Here is another Golden Age comic book character with whom I was not familiar: Sub-Mariner. 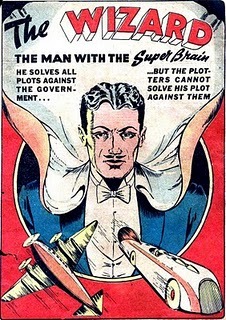 He was the mutant son of a human sea captain and a princess from Alantis, who was apparently one of the first comic book superheroes. 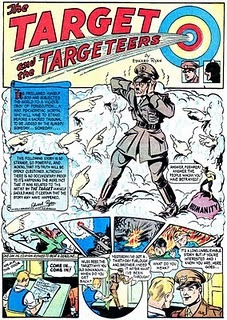 Pappy's Golden Age Comics Blogzine posted this 1948 issue. This morning's Sunrise Serenade was "A Kid Named Joe" by the Mills Brothers. Click on the song title to listen courtesy of Jazz On Line. 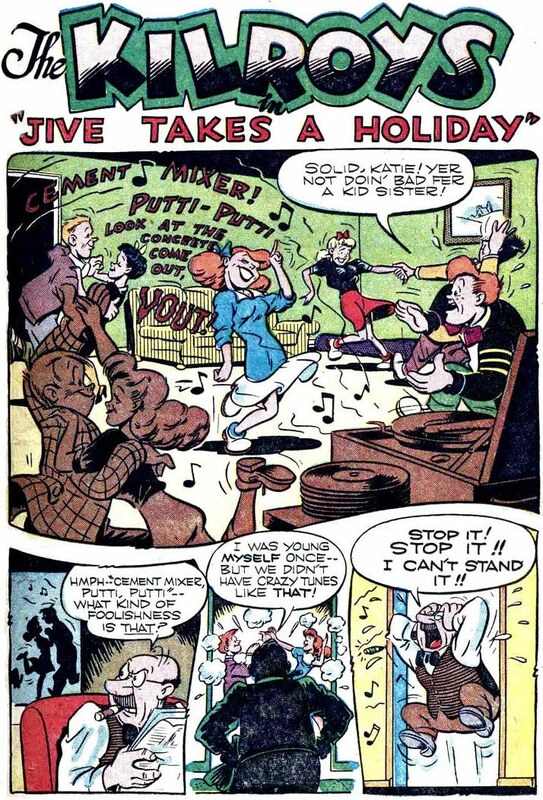 This Warner Bros. cartoon about folks rushing about in a frenzy of materialism seemed appropriate for yesterday's "Black Friday" shopping event. 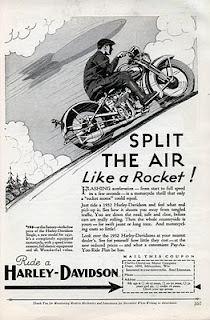 From the Internet Archive, here is Gold Rush Daze. 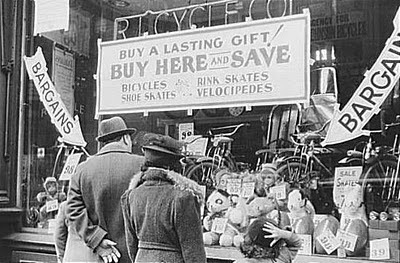 As many venture out into the frenzy of consumerism that is Black Friday, please be careful in the crowds and traffic, and courteous to your fellow shoppers. After all, one of the themes of the season (in more than one faith) is supposed to be PEACE. Window shoppers looking at a toy display in downtown Providence, Rhode Island in 1944 - From the Library of Congress American Memory Collection: America From the Great Depression to World War II. From myself and the rest of the Swing Shift Shuffle crew at the WEVL Music Factory, have a Happy Thanksgiving! 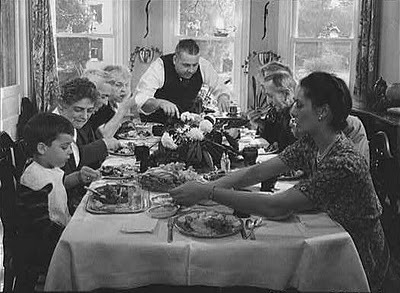 Thanksgiving 1944 in the home of a family in Neffsville, Pennsylvania - From the Library of Congress American Memory Collection: America From the Great Depression to World War II. 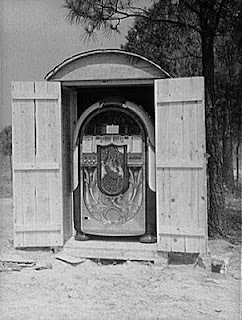 The playlist for the November 24, 2010 broadcast of the Swing Shift Shuffle has just been added to the playlist filing cabinet. 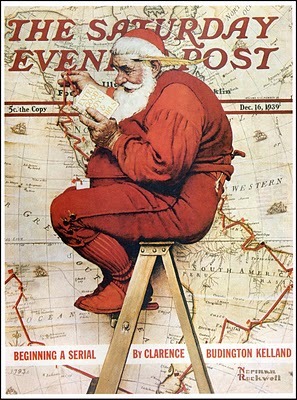 The Red Hot Lindy Hop takes a Thanksgiving holiday break this Friday night to let everyone recover from the feasting and Black Friday, but it will be back next Friday, December 3. 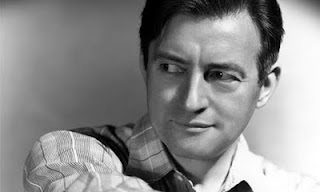 This morning's Sunrise Serenade was "Jeepers Creepers" by Bert Ambrose and his Orchestra. Click on the song title for a sample courtesy of emusic, or click here for the album page. 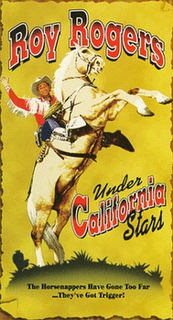 Over at the [Matinee At] The Bijou Blog, there is a great article about Republic Pictures' 1948 release, Under The California Stars, featuring the "King of the Cowboys," Roy Rogers. In addition to information about the movie itself, this post provides a nice history of Rogers, Dale Evans, the Sons of the Pioneers and, of course, Trigger. By the way, the rider in Trigger's first movie appearence was not Rogers, or any other cowboy for that matter. 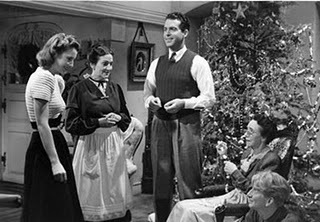 He was the mount for Maid Marian (Olivia de Havilland) in the 1938 film, The Adventures of Robin Hood when Errol Flynn swung in to welcome her party to Sherwood Forest. Today's Sunrise Serenade was "Hi Ho Trailus Boot Whip" by Anita O'Day. 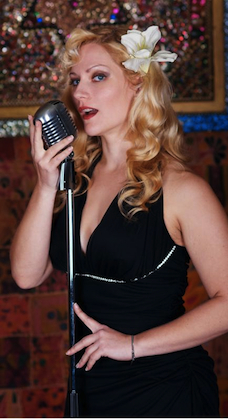 Click on the song title to listen courtesy of Jazz On Line. 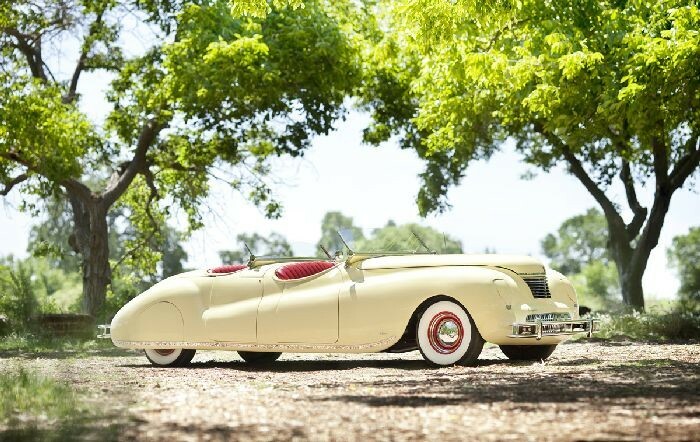 The Hemmings blog noted that two extremely rare cars will be offered at the Goodings & Company auction in Scottsdale, Arizona in January 2011. 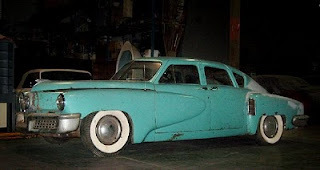 The first is an all original Tucker 48, with only 10,000 miles, that has apparently been resting quietly in a private barn for over 50 years. 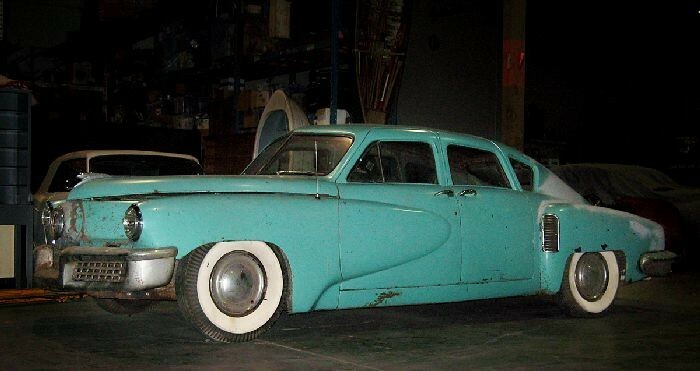 Considering that Preston Tucker built less than 50 of his namesake cars, this story falls into the ultimate "barn find" category. 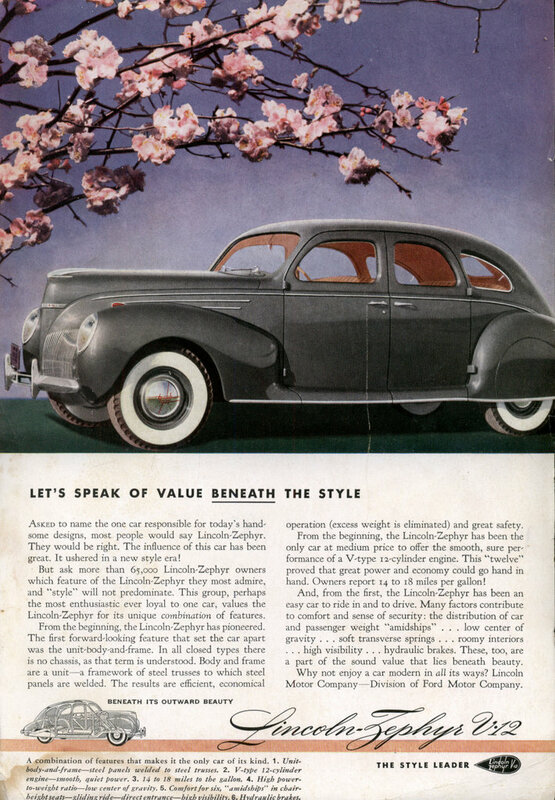 The other is one of only five surviving 1941 Chrysler Newports with LeBaron coachwork. Expected sale price on each? Over $1,000,000. This morning's Sunrise Serenade seemed appropriate for Monday before Thanksgiving. It was "Flyin' Home" by Woody Herman and his Orchestra. Click on the song title to listen courtesy of Jazz On Line. For Thanksgiving, we invite the great Tex Avery to tell the story of a simple Pilgrim looking for that first Thanksgiving Day meal, and throw in a pack of World War II era jokes to boot. 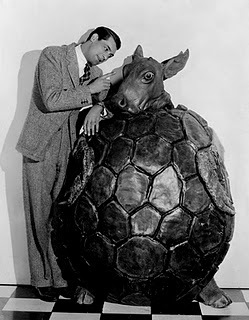 From the Internet Archive, the 1945 animated short, Jerkey Turkey. The Gypsy Hombres return to Memphis as part of the Broad Avenue Arts District urban renewal event: A New Face For An Old Broad, this Saturday, November 20, 2010. The Hombres will play from 12:00 to 1:30 p.m., and there are plenty of other things to see, hear and do. Below is a video from an Hombres performance earlier this year. Today's Sunrise Serenade was certainly appropriate for the end of a work week: "Wrappin' It Up" by Fletcher Henderson and his Orchestra. Click on the song title to listen courtesy of Jazz On Line. 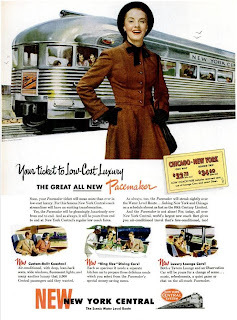 This item from Vintage Ads depicts train travel in the days before airlines took over as the prevalent means of transportation. 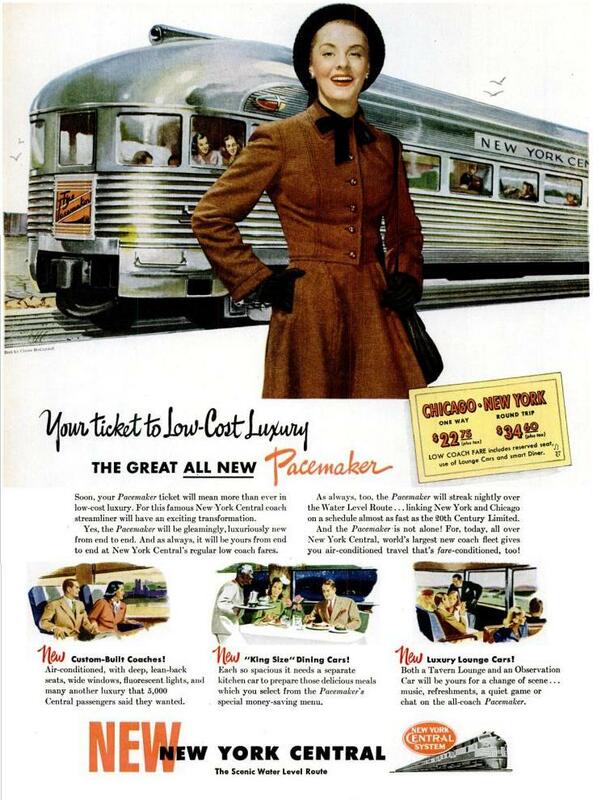 This 1947 advertisment promotes the "low cost luxury" of the New York Central Pacemaker. 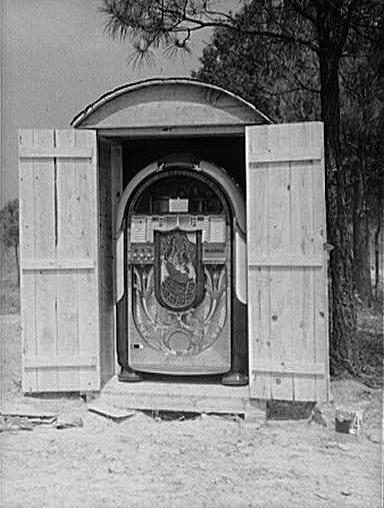 The playlist for the November 17, 2010 broadcast of the Swing Shift Shuffle has just been added to the playlist filing cabinet. 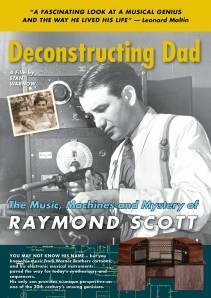 Thanks to Boing Boing for letting me know that Deconstructing Dad, a documentary about composer and inventor Raymond Scott, is out on DVD. In a related family note, John Williams' dad, Johnny Williams, was a member of the Raymond Scott Quintette. 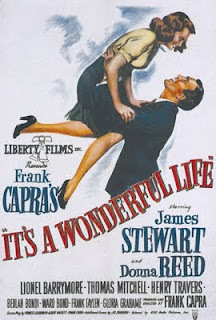 The film, which was directed by Scott's only son, features movie-music legend JOHN WILLIAMS ('STAR WARS'), producer HAL WILNER, MARK MOTHERSBAUGH of DEVO, jazz clarinetist DON BYRON, archival footage of EDWARD R. MURROW, and DJ SPOOKY, aka Paul D. Miller. This morning's Sunrise Serenade was "Dreamer's Holiday" by Bing Crosby and Ella Fitzgerald. Click on the song title for a sample from emusic, or click here for the album page. As the cool weather arrives, keep warm with the weekly Red Hot Lindy Hop lesson and session Friday. The lesson will be by Jaredan and Erin, with music by Jaredan. Free admission before 7:00 p.m., and $5 at the door afterwards. 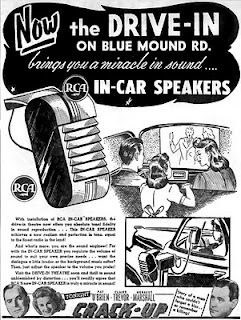 The fact that this advertisement, posted on Vintage Ads, promoted "in car" speakers as "new" made me wonder what sort of sound system drive-in movies used before their invention. 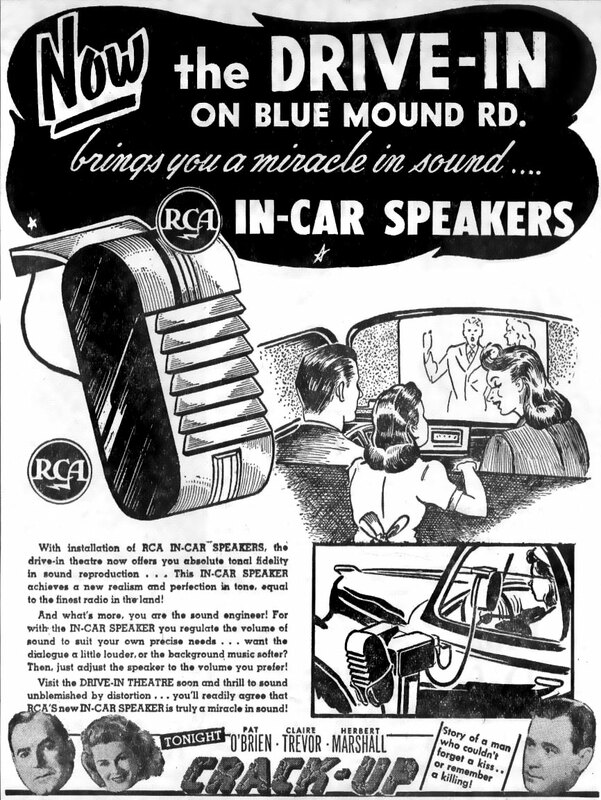 I just assumed that in car speakers existed since the beginning of the drive-in. 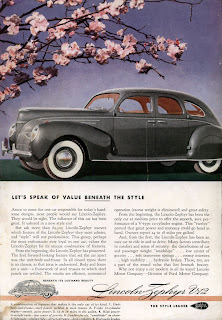 Anyone know how folks heard the sound before in car speakers? As cooler weather finally arrives in Memphis, this morning's Sunrise Serenade was "I've Got My Love To Keep Me Warm" by Red Norvo and his Orchestra. Click on the song title to listen courtesy of Jazz On Line. This 1941 black & white cartoon, directed by Bob Clampett, seems like a rough draft for Warner Bros.' later release, Little Orphan Airdale, directed by Chuck Jones. The underlying story is the same, but with different gags. The placement of animation over what appear to be photographed backgrounds is interesting, and I like the Carman Miranda reference. 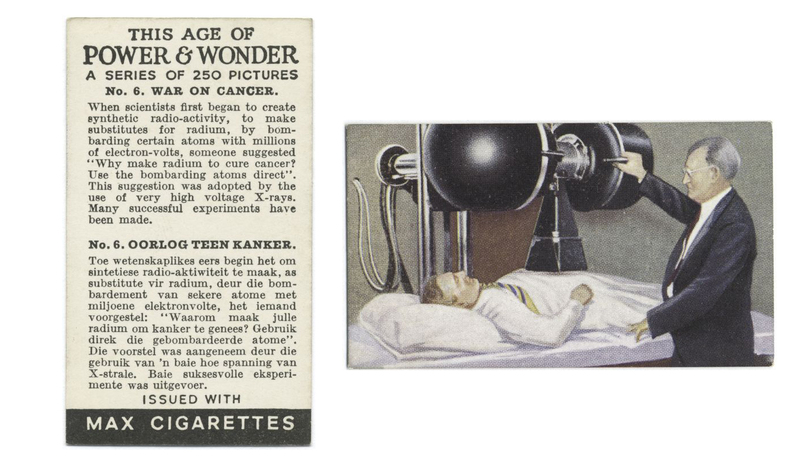 From the Internet Archive, here is Porky's Pooch. 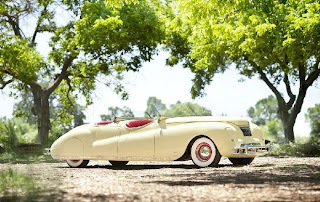 On the other end of the three wheel vehicle spectrum from the little Morgan trike was Buckminster Fuller's Dymaxion car. Boing Boing posted that a British architect has commissioned his own. 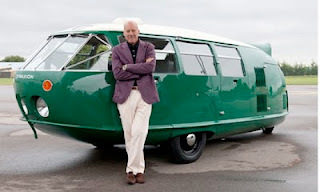 In 1933, Buckminster Fuller designed the Dymaxion car, a concept vehicle that could hold 11 passengers and had a fuel efficiency of 30+ miles per gallon. 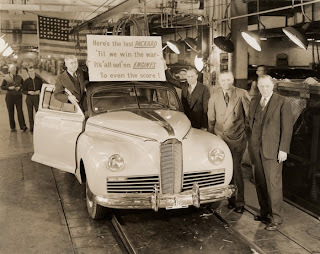 Three prototypes were built, but the only survivor is in the National Automobile Museum in Reno, Nevada. Recently though, renowned UK architect Norman Foster, one of Fuller's colleagues late in his life, commissioned construction of his own Dymaxion car. On Veterans' Day, one often sees photos or images of military personnel in dress uniforms, in parades, etc. I came across this photo from the Library of Congress American Memory collection: Depression Era to World War II. 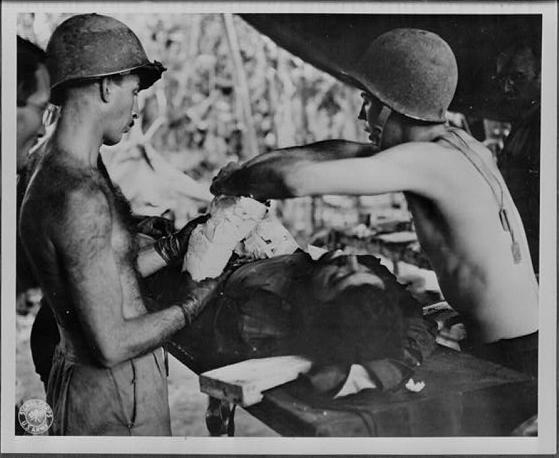 According to the caption, it depicts an operation on a wounded American soldier by Major George Marks. 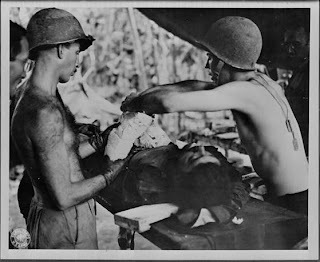 The soldier was wounded in the arms and shoulders by shrapnel from a Japanese mortar as he was storming a pillbox in New Guinea in 1944. This picture reflects the realities of why we have Veterans' Day. As often happens on a Thursday, this morning's Sunrise Serenade was a song I played on the show last night: "The Woodpecker Song" by the Andrews Sisters. Click on the song title to listen courtesy of Jazz On Line. 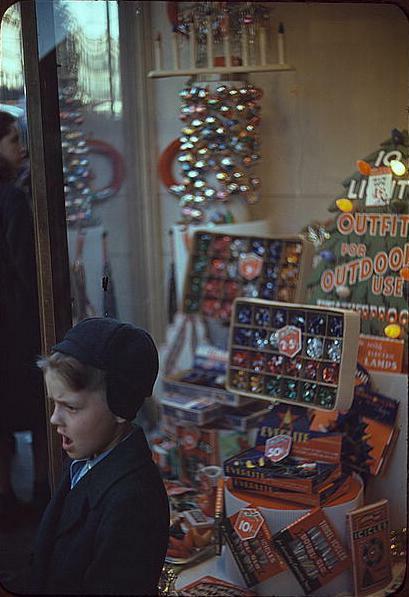 Playlist For November 10, 2010 - Fall Pledge Drive Special! 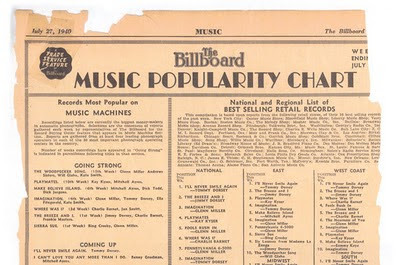 The playlist for the November 10, 2010 broadcast of the Swing Shift Shuffle, the Fall Pledge Drive Special celebrating the 70th anniversary of the Billboard record sales charts, has just been added to the playlist filing cabinet. The Red Hot Lindy Hop lesson and session continues this week with a lesson by Matt and Amanda and music by Amanda. Free admission before 7:00 p.m., and $5 at the door afterwards. Today's Sunrise Serenade was an encore from October: "Ah, Your Father's Mustache" by Woody Herman. Click on the song title for a sample from emusic, or click here for the album page. 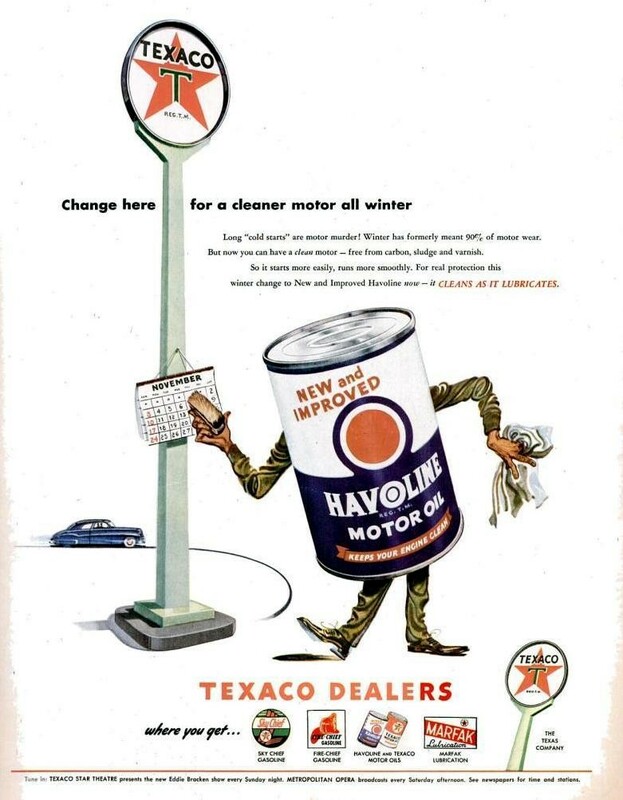 Swing Shift Shuffle Fall Pledge Drive Special Tomorrow! 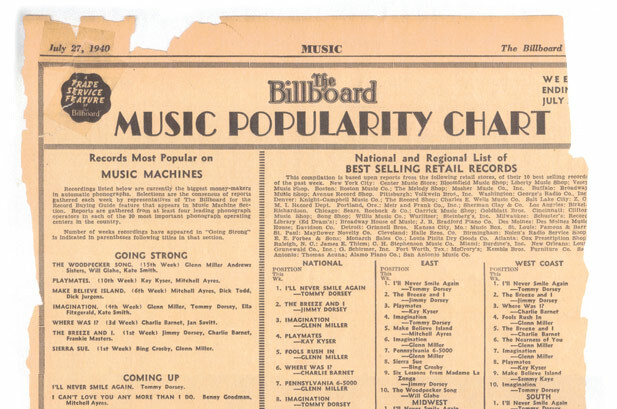 For the Swing Shift Shuffle Fall Pledge Drive Special, we will celebrate the 70th anniversary of the Billboard record sale charts by featuring songs and tunes from Billboard charts for the year 1940. 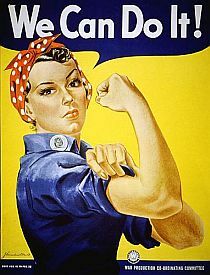 Tune in, and remember to call 901-528-1990, or go online with your pledge of support to WEVL! This morning's Sunrise Serenade was "Believe It, Beloved" by Fats Waller. Click on the song title to listen courtesy of Jazz On Line. 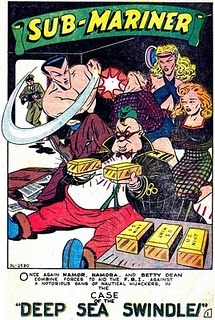 Over at Pappy's Golden Age Comics Blogzine, Pappy combines comics and swing with this post of an issue of The Kilroys. In this story, Mr. K expresses his frustration over his daughter's fascination with the nonsensical music of the modern age (1947! 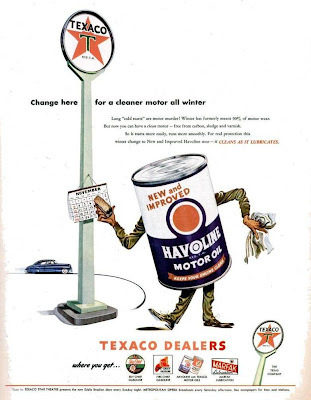 ), stuff like "Cement Mixer, Putti, Putti" by Slim Gaillard. It has some fun swing reference details like a poster for "Gene Trupa."